Perhaps the best thing about the month of November, other than all the football, is Thanksgiving! As I was thinking about what to write about this month, of course Thanksgiving came to my mind. Most people have fairly set traditions surrounding their Thanksgiving Day feast, I know my family does. We always have the same delicious foods, and everyone loves what we do! I thought that perhaps most people won't want to experiment with the actual Turkey Day food, maintaining the good old "if it ain't broke, don't fix it!" mentality. I mean, Thanksgiving dinner in a big deal, very high profile, particularly if you are entertaining for the meal. But, what about all of the leftovers? I know in my family, there are always lots and lots of leftovers! It's all fine and good to have the same meal again for dinner the next day, and to have a seemingly endless supply of turkey sandwiches, but what if you could find a few dishes that used your leftovers that might be good enough to become a tradition of their own? I thought it would be fun to find some inventive ways to use your leftover turkey, potatoes, cranberries, and stuffing instead of just re-heating it in the microwave for days afterwards. Who knows? Perhaps the day-after-Thanksgiving may have some new traditions of its own forming!  One of the best ways, of course, to re-use your leftover turkey is the traditional turkey sandwich. Bread, turkey, cheese, mayo. And there is nothing wrong with that! But, here is a new idea for a re-vamp of an old classic: the Turkey Reuben! 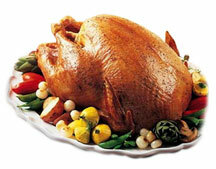 Place your turkey on the requisite rye bread, and then top with slaw-try a fruit based slaw for a twist. Many times your grocery store deli will have something like an Apple-Pear slaw (my recommendation) or something similar. If you do try a fruit slaw, add some of your leftover cranberries to the mix! I also recommend Havarti cheese and dill pickles to finish it off!  One of my favorite dinners is Shepherd's Pie. This is traditionally made with ground beef, but as a fun twist, use your turkey instead! Cut up your leftover turkey into bite sized pieces. Mix together with your leftover gravy (canned Cream of Chicken soup would also work if your gravy is gone) and any veggies you have left (we always seem to have leftover corn). Spread that in a baking dish and top with your leftover potatoes, and sprinkle with cheese. Bake in the oven for about 35 minutes or until your cheese starts to bubble. Delicious! 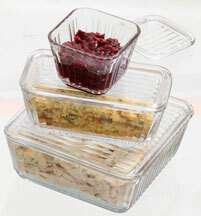 This is a great way to re-use lots of your leftovers in a new way, serve with any extra rolls or other breads!  Another easy idea is a Turkey Pot Pie. This will again use your leftover turkey, gravy, and veggies. Simply mix these ingredients together and put in a refrigerated pie crust. Top with another pie crust, cutting a few slits in the top to vent, and bake for about 40 minutes, or until the crust is golden brown.  There are a few ways to re-use your potatoes, and they are all delicious! I love mashed potatoes, it's one of my favorite parts of the meal. One of my other favorite foods is bacon - so I figured we could combine two of my favorites to create a new flavor! Take about 4 cups of your leftover mashed potatoes. Add roughly 1/2 cup sour cream and fold in to potatoes. Add chopped green onions, onion powder (about a teaspoon) and black pepper to taste. Spread the mixture in a greased baking dish. Top with shredded cheese and cooked, crumbled bacon. I like my bacon extra crispy, but since you are going to bake this, remember that the bacon will crisp up a little bit in the oven. Bake until the cheese bubbles. I think this is a meal that will start causing you to purposely make too many potatoes, just so you can enjoy these leftovers!  Another really fun idea, and one that can be made to any person's taste, is to make mashed potato balls! Once your potatoes have cooled, they will be easy to form into balls. Roll them into ball shapes and then top with your favorite seasonings such as: chives, salt, pepper, paprika, seasoning salt, or even cayenne pepper for a little added kick! Place these on a baking sheet that has been lightly sprayed with cooking oil, and bake for about 25 minutes in the oven or until golden brown. You can get pretty creative with these potato balls, try wrapping a piece of cheese inside them before baking, yum! You can also add things like chopped green onions, or wrap the potatoes around a chunk of jalapeño or habanero pepper! There is really no wrong choice to this style of potato, and it's fun for the family since everyone can customize their own potato ball! Kind of gives a new spin to the standard baked potato bar, and uses your leftover mashed potatoes to boot!  Lastly, this is an idea that comes from my husband's family. I had never heard of this before, but it was a standard in their house growing up: Hot Dog Boats. They would boil their hot dogs and then split them open lengthwise. Then, they would pile on their leftover mashed potatoes and sprinkle them with cheese. They get broiled in the oven until the cheese is melted and slightly golden brown. I have heard story after story about these Hot Dog Boats from my in-laws, all of the kids love them!  One of the best ways I could think of for using leftover cranberries is to use them in muffins! I love muffins, and recently got to look through "The Complete Muffin Cookbook", which is one of the new cookbooks we are featuring right now. If you have the Cook'n software and you get this cookbook, once you use the nutritional analysis on these recipes, you will be surprised at how wholesome-ly delicious they are! Gloria Ambrosia really made an effort to keep your figures in mind when she created this cookbook, and she has pages and pages of great tips. Remember, for you Cook'n Club members, you get a free cookbook every month and I highly recommend this one! Not part of the Cook'n Club yet? Click here to find out more about the Cook'n Club! This cookbook has lots of great muffin ideas, from fruity to wheaty to herby to spicy, and back! There are also great recipes for glazes and icings too. She has a few great muffin recipes that call for cranberries including Cranberry-Orange Muffins and Berry Berry Delicious Muffins. These recipes may call for dried cranberries, but if you toss your cranberries in with your wet ingredients (eggs, oil, etc.) they will still turn out delicious!  Stuffing is also something that always seems to have leftovers, because it's so good that we always make too much! Here is a fun idea for your stuffing leftovers, and it will taste great after doing your early morning Black Friday shopping: Stuffing pancakes! All you need to do is add 1 beaten egg to about 2 cups of your stuffing. Form them into small pancakes and then let them sit for about 5-10 minutes so the egg absorbs. Melt a little butter in a frying pan and then add your pancakes and cook until golden brown on both sides. Serve these topped with your favorite type of eggs-scrambled, poached, fried, whatever is your favorite. 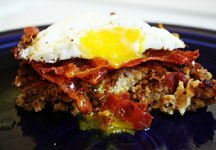 You will have a hearty breakfast that will remind you of your Thanksgiving feast.  Stuffing is also a great accompaniment to pork chops. A nice simple meal after making all of your Thanksgiving food is to brown your pork chops, and place them in a lightly greased baking dish. Cover with apple pie filling, followed by your leftover stuffing. Bake in the oven for about 20 minutes or until heated through. Quick and delicious!